KULTUR FÜR KINDER is not only linked to the cultural institutions, but also works closely with many of Vienna’s primary schools. These schools are part of the KULTURSCHULTÜTE project and we are pleased to report high levels of engagement amongst the teachers and school heads. The KULTURSCHULTÜTE project currently supports more than 4.000 primary school pupils in Vienna. Many of the schools have pupils from a number of different nationalities, teachers that work in challenging classroom situations, and limited access to cultural events. The KULTURSCHULTÜTE proves support to teachers to enable them to integrate art and culture into the daily curriculum. 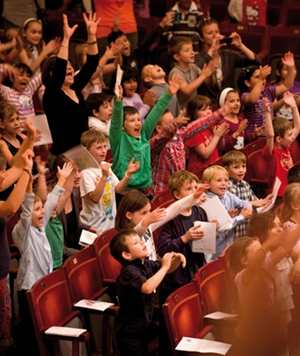 KULTUR FÜR KINDER works as a mediator between the schools and cultural organisations to provide children with a cultural education and encourage their creativity. At the same time KULTUR FÜR KINDER programmes, organises and finances cultural projects, and puts on interactive workshops children and their teachers. All of our culture schools are run by highly engaged head teachers. Another addition to the KULTURSCHULTÜTE this year is the Volkschule Brüßlgasse in the 16th district, which is home to 320 pupils. There are 14 classes, two of which are mixed-age. Everyday life at the school is enriched by a focus on sport and movement-based learning, multi-lingual reading, language projects, mother tongue and progressive teaching, intercultural learning and additional support lessons in the afternoon. The ambitious teaching staff places equal importance on the harmonious cooperation of pupils from different cultures as on the fostering of each child’s individual skills and talents. The primary school VS Corneliusgasse is a state school in the 6th district of Vienna and with over pupils. The teachers are highly dedicated and engaged, giving the children enough space for creativity. The VS Corneliusgasse has been part of the KULTURSCHULTÜTE since 2015/16. The Henry Dunant primary school was the first ever KULTURSCHULTÜTE partner school. Based in the 21st district, it has been involved in our programme since 2013/14, meaning by the end of the school year 2016/17 the fourth grade-pupils will have been through all of our four years of the KULTURSCHULTÜTE. Special merit belongs to the director, Evelyn John, for her dedication and engagement. Together with her great team of teachers she enables many cultural projects that help integrating children from many different nations. For more then 100 years the OVS Hochsatzengasse is based in the Penzinger district Baumgarten, and currently teaches about 320 children with many different nationalities. Its truly dedicated director supports her teachers and enables projects like the KULTURSCHULTÜTE , of which the Hochsatzengasse primary school has been a member since 2014/15. KULTUR FÜR KINDER is pleased to welcome the Volksschule Kaisermühlen on board and looks forward to many joint projects! This bilingual primary school is located in the 22nd district between the Old Danube and the New Danube. 235 pupils attend the school – many with international backgrounds. 30 different mother tongues are spoken by the pupils. Lessons are taught in German and English with both Austrian teachers and English Native Speakers. The highly motivated team of teachers place great value on actively incorporating the varied cultural lives of the pupils, and prioritise healthy nutrition and sport. The school is a member of the network “Vienna Healthy Schools”. We are pleased to welcome to the Kulturschultüte the Landhausschule in Vienna’s 11th district! This state school in Svetelskystrasse currently has 390 pupils across 17 classes. The school prides itself on creating positive learning environments based on mutual appreciation and respect. The certified ‘autonomous’ school places at the centre of its teaching the encouragement of personal development, social learning, health education, prevention of violence, literacy skills, multicultural learning and much more. The Leopoldschule in the second district is a center for children with special needs, taking a creative pedagogical approach. Director Monika Kink and her highly motivated team of teachers encourage children with special needs with cultural projects. The Leopoldschule is seen as an outstanding ‘role-model’-school in Vienna and has been part of the KULTURSCHULTÜTE since 2014/15. Another new member of the KULTURSCHULTÜTE is the Volkschule Liebhartgasse. In Vienna’s multicultural 16th district a team of highly engaged teachers works with 330 children in 16 classes. These span from pre-school classes to “special focus classes”, integrative classes and a progressive mixed-age class. The school aims to be a bridge-builder for children with different nationalities and languages. The school operates the Dual Language Programme and has a focus on English and the mother tongue languages of the pupils. Together with Headmistress Sabine Klasek the teachers lay the foundations for education in art and culture. We are looking forward to many future KULTURSCHULTÜTE projects. The GTVS Rosa Jochmann-school in the 11th district is a new partner school with its 330 children. The teachers are very engaged and there a focus on environmental, health and sports issues. They have many sports and cultural clubs for pupils to take part in. They have had a school parliament since 2013. The primary school VS Rothenburgstraße, located in the 12th district, has 17 classes and includes a scholarship center for outstanding pupils. Children with difficult social backgrounds are supported by their dedicated teachers, who enable them to take part in arts and cultural projects. The Rothenburg-School has been part of the KULTURSCHULTÜTE since 2015/16. KULTUR FÜR KINDER welcomes the VS Rötzergasse as a new partner school in the KULTURSCHULTÜTE. This primary school in the 17th district has 12 classes including four integration-classes and one class for refugees. More then 30 languages are spoken in total. The dedicated and active team of teachers has additional mother tongue teachers from Turkey, Albania, Arabic countries and Poland. The Schöngasse primary school is pleased to be a part of the KULTURSCHULTÜTE for the first time this academic year (2017/2018). This school in the second district has a flair for multiculturalism. Pupils with over 30 different mother tongue languages are nurtured by highly engaged teachers with the aim of enabling a comprehensive vision for cooperation and togetherness. KULTURSCHULTÜTE projects should support them in this quest. Alongside a basic education the pupils should be encouraged to be creative and to think independently, they should retain their joy of life, build self-confidence and discover the world together. It is our great pleasure to cooperate with the Volksschule Siebenhirten in the 23rd district. Its 240 children probably have the longest distance to getting to their cultural projects in the center of Vienna. With 23 spoken languages the school has pupils from all over the world and tries to support their language skills. In addition to mother tongue teachers they support inter-cultural-learning and consciousness.